AERO Friedrichshafen bills itself as “The Global Show for General Aviation.” If you read our post highlighting AERO 2014, you will know the convention is a favorite of the Hartzell team. With so much to see, it can be hard to put together an agenda for AERO Friedrichshafen. We have put together our top 5 things to check out at AERO 2015. What are you looking forward to? Let us know on Facebook or Twitter. There is a reason attendees call AERO the “homebase of Europe’s General Aviation.” With over 600 exhibitors from 35 countries serving more than 33,000 attendees, it is a truly massive event. We recommend downloading the AERO Friedrichshafen app before you join the throng of aviation enthusiasts. This year’s app has includes 2D and 3D mapping functionality, details on all the events and exhibitors and support for the new myAERO pages, which let visitors customize and manage their AERO experience from any device. This alternative fuel aircraft made its first flight just a week ago. The airframe is made entirely of carbon composite material. The advanced material choice, which has defined Flight Design’s successful CT series of aircraft, offers significant weight savings. The C4 takes advantage of the decrease in weight to improve performance and comfort. The aircraft can easily fit four passengers and accommodates loads up to 1320 Lbs. Flight Design says the aircraft is “future proof” thanks to its Continental IO-360AF alternative fuels engine. That engine is paired with one of Hartzell’s high performance aluminum props, allowing it to reach the maximum power output of 180 horsepower without exceeding stringent new environmental noise standards. You can find out more about Hartzell’s collaboration with Flight Design here. Check out the video below to learn more about the C4’s first flight. The Hartzell team is kicking off the 2015 aviation conference season with a return to AERO Friedrichshafen. AERO gives the team the opportunity to meet with innovators and aviators from around the world. It is quickly becoming one of our favorite events. Stop by the booth to learn about our newest certifications, talk about the revolution in composite technology that has defined performance aviation in recent years or just talk shop with our prop experts. Hartzell is located in Hall A3 at booth 124. That’s A3-124; stop by and chat! This section of the show promises a “comprehensive overview of the potential applications of unmanned flying machines.” AERO has planned a full UAV conference with workshops targeted at all potential civilian applications, an exhibition hall, an indoor airfield and an outdoor staging area. 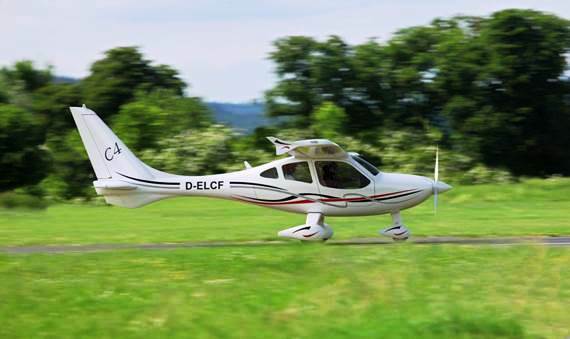 Designed by Pipistrel of Slovenia, the Alpha Electro is the first electric aircraft created primarily as a trainer for flight schools. The plane uses six batteries which are charged via solar cells. A full charge takes just 45 minutes, but the batteries can also be swapped out in just five. The airplane’s propeller technology is also intriguing. It was specially designed to return power to the batteries while the aircraft descends.